ISBN 1596153474. 9x12.25 inches. 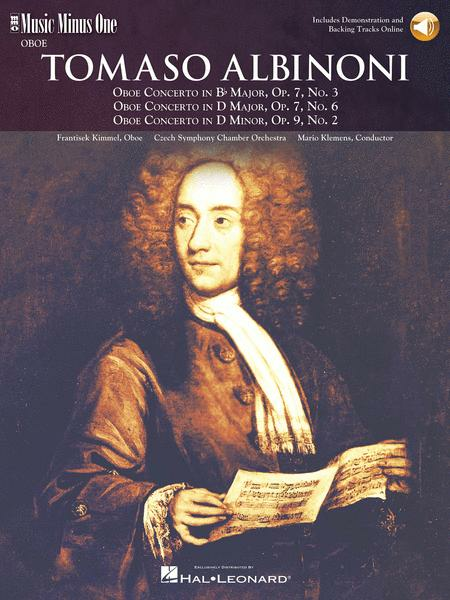 Italian Baroque Master Tomaso Albinoni is sometimes overlooked due to his fellow countryman Vivaldi's immense popularity, but this collection demonstrates the immense gifts which Albinoni exhibited as a composer. These three concerti are representative of his beautiful Baroque style. Includes a high-quality printed music score and a compact disc containing a complete performance with soloist, then a second version with the orchestral accompaniment, minus the soloist; and a second compact disc containing the complete performance again, followed by a special -20% slow-tempo version of the accompaniments, to aid you as you learn the piece. Performed by Frantisek Kimmel, oboe Accompaniment: Czech Symphony Chamber Orchestra Conductor: Mario Klemens.